What do Barcelona & Real Madrid fans think of Atletico Madrid’s 2014-15 season? While looking ahead to the new season, often expectations and predictions are marred with a clear bias. Every supporter thinks that either it’s their year or at the very least that they will fare better than one or more of their rivals. Keeping that in mind, we’ve found it interesting to see what rival supporters think of a teams’ chances in the 2014-15 season. This particular piece has Anustup Sikdar from our Barca blog Cules’ Corner and Mark Denis Ong from our Real blog, The Royal Pages, discussing Atletico Madrid ahead of the 2014-15 season. 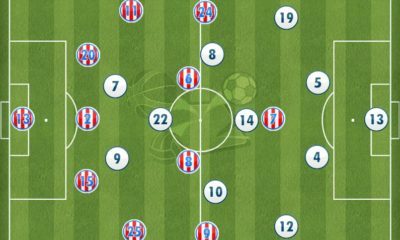 What are Atletico Madrid’s objectives this season? Anustup (Cules’ Corner): Simeone is a very pragmatic manager. He knows that that 2013-14 season will not happen this time around. Both Barcelona and Real Madrid dropped points cheaply. And Atletico have lost a few key personnel who were very much the part of the machinery. They have competent replacements, but they might need time to settle. At most Simeone will hope to successfully defend the domestic title. Challenging on two fronts will be tough for them. Mark (The Royal Pages): Atletico cannot be expected to compete for silverware this season (except perhaps the Copa Del Rey). Chelsea have essentially pillaged their team resulting in the loss of the team’s key cornerstone players: Courtois (loan expiry), Costa, Felipe Luis. 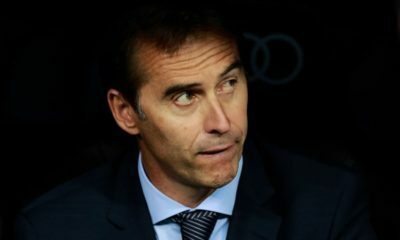 The realistic expectation ought to be third place in La Liga. Atleti have always been the team with the talent capable of being Spain’s third team, except that they always somehow conspired to sabotage their own chances in the past. In Simeone, they have a coach who can steady them on a sporting level, whilst allowing the upper management to sort their financial woes gradually while progressively acquiring young talent for the future. Having said that, if Atleti mount the sort of title challenge that they did last season, then FIFA / UEFA should just stop taking votes on who the Coach of the Year is and just hand it to Simeone! How do you think Atletico Madrid will do this season? Anustup (Cules’ Corner): Atletico will not do too bad. They are defending champions in Spain and even if they know that they have a better shot at defending their Liga title, something tells me that they will now look to scale new heights in Champions League. But before that their squad needs to gel. Mark (The Royal Pages): It depends on how they cope with the changes to their squad this coming season. What does Atleti without Courtois and Costa on either end of their spine look like? How they cope with these massive changes will shape their season. Personally, I think Atleti will secure 3rd place safely with no fuss though I do not believe that they will contend for the title. They will however remain legitimate contenders to convincingly beat Real Madrid and Barca in the league meetings or in the cups. Who do you think will be Atletico Madrid’s key player? Anustup (Cules’ Corner): Koke for sure. Xavi has retired and no one in Spain is more competent than Koke to take up the mantle. Should injuries not disrupt his season, Koke will be the talisman for Atletico Madrid this season. But don’t forget the mercurial French winger Antoine Griezmann. Mark (The Royal Pages): I’m looking to Koke to drive their team. The solidity of the Miranda-Godin centre-back partnership will be there again. Gabi will still be a stalwart but he’s on the wrong side of 30. Mandzukic I’m sure will score goals, but how cohesively Atleti can play the ‘Simeone way’ will be down to Koke. I guess you can say that he will be to Simeone who Xavi was to Pep in Barca. What is Atletico Madrid’s biggest weakness? Anustup (Cules’ Corner): At present there aren’t too many keepers who can replace Thibaut Courtois. Miguel Moya is a good keeper at best. He is certainly not in Courtois’ category, while Jan Oblak is still young and unproven himself. This is where I think Atletico will face some issues. Mark (The Royal Pages): Atleti’s short squad will be their weakness again. What do you think of Diego Simeone as a manager? And his future? Anustup (Cules’ Corner): Under Simeone they have had their best season in a long time and no sane board can sack the Argentine. To be honest, it will be only too naive on the part of the boards to sack him. Giving him time to build a great team is the only logical option, especially after their heroics last season. Mark (The Royal Pages): What Simeone is doing with Atleti is one of the greatest examples of master-class coaching in this era. The last person Atleti can afford to lose is Simeone. Anustup (Cules’ Corner): Koke is 22. Otherwise he’d have been an undisputed choice. Apart from that, I really do not think anybody aged 21 and below will play that significant a role for Atletico. Said that, I really wish to win the ‘Foot In Mouth Award’ for this, because nothing will be more pleasing than to see a youngster playing a big role for Atletico or any other club for that matter. Mark (The Royal Pages): Atleti are a team of badass hard-as-knuckles types. I do not foresee an under-21 player making an impact for them. What do you think of Atletico Madrid’s transfer activity? Anustup (Cules’ Corner): Simeone has been very prudent. He replaced Costa with another proven striker – Mandzukic. I have always felt that Mandzukic is a tad better than Costa and with the kind of midfield Atletico has, I am expecting nothing less than 20 goals from him this season. Add to that Griezmann. But if you ask me, their best acquisition has been Guilherme Siqueira. Atletico sold Luis for 20 million Euros and signed Siqueira for half that amount and both are of the same age. Siqueira is good enough to replace Luis and this is their best business this season. Mark (The Royal Pages): Oblak, Mandzukic, Griezman, Siqiuera and Ansaldi on loan. We knew this wasn’t the insane Atleti of the recent past and they continue in a very positive manner with shrewd and sensible signings for them. I spent all of last season wondering who will manage to land Mandzukic this summer and enjoy his work rate, goals and #9 play: a masterful signing by Atleti. The Griezman signing in particular will be a coup: he gives them a sudden shot of creativity and pace. Once they’re blooded into Simeone’s system, the thought of Koke and Griezman steaming at you from the flanks with Mandzukic barreling through the middle will be a scary thought. Read all our Read & White articles here.